A long time ago, there lived a young girl in a village near a forest. She flaunted a red cap having a red hood. One fine day she thought of visiting her grandma by travelling across the forest. On the way to her destination, a wicked wolf is determined on devouring the young girl. In the online slot machine game Fairytale Legends: Red Riding Hood slots by NetEnt, help the little red riding hood reach her grandma safely. NetEnt has been charming the world for nearly 20 years as pioneers of online gaming. In 1996, NetEnt was founded and in 2002 it launched its first casino game and till date the developer has handled nearly 21.4 billion transactions. 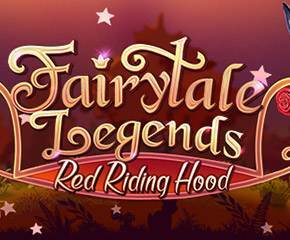 Fairytale Legends: Red Riding Hood slots features 5 reels and 20 pay-lines set in 3 rows. It comprises a variety of memorable features and images on its reels. The backdrop of this online slot game is very unique. The minimum bet limit is only 0.20/spin and the maximum capped stake is 200.00/spin. Sticky Wild Re-Spins – Red Riding hood is the adorable wild symbol and in standard mode appears on 2, 3 and 4 reels while in free spins mode appears on all reels. 2 or more wild icons landing on the reels trigger the Sticky Wild Re-spin. 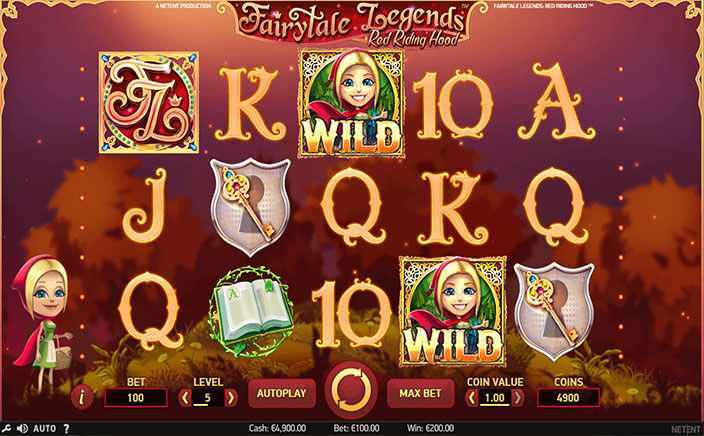 Random Features – 3 features of Fairytale Legends: Red Riding Hood slots that are randomly triggered are Fairy Surprise, Fairy Wild and Fairy Magic Spin. A fairy surprise is triggered when you don’t win while spinning and it might provide consecutive re-spins till a winning combo is cashed out. The Fairy Wild occurs when three or five wild icons are joined to the reels, whereas a re-spin is on the slot game. The Fairy Magic Spin promises between 5 and 9 overlaying icons. Bonus – Apart from the random bonuses, the slot offers three other bonus features which are the bonus of free spins offering 10 free spins including a bonus of sticky wild re-spins, the second is the Beware the Wolf Bonus promising a cash trail game in which 200x multiplier can be won. The last bonus is immediate win cash game where 15x multiplier can be won. NetEnt has taken a loveable and classic story and turned it into an action and fun packed slot- Fairytale legends: Red Riding Hood.